To celebrate the release of this film, we’re hosting an exclusive giveaway in partnership with Universal Studios for a pack of extremely limited goodies. With winter right around the corner, I can't help but look forward to Tomas Alfredson's upcoming horror crime The Snowman! How to Enter: To enter the giveaway, simply fill out the form below. The winner will be randomly chosen. Each addition step completed increases the number of entries you have. The giveaway is open to 18+ or older residents of the U.S and Canada only. The winner will be selected on October 27th and their address must be submitted no later than October 29th. 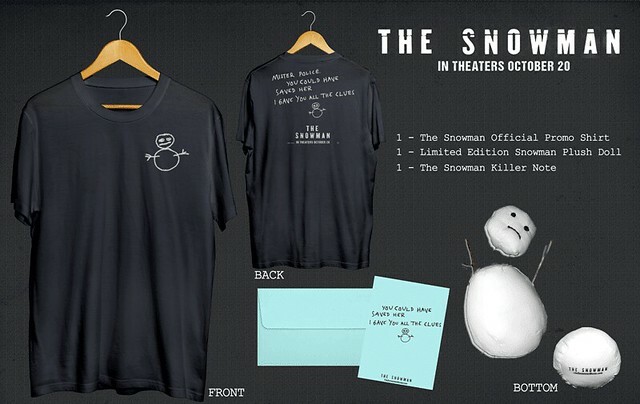 The Snowman, a terrifying thriller based on the novel by Jo Nesbø, is being released on October 20th. A sociopath who calls himself “The Snowman Killer” has targeted the one person for whom he wants to showoff his methodical, unthinkable skills: the lead investigator of an elite crime squad. With cunningly simplistic baits, he begs to have a worthy opponent to play his sick game. The film stars Michael Fassbender, Rebecca Ferguson, Val Kilmer, Chloe Sevigny, J.K. Simmons, Toby Jones, James D’Arcy, and Charlotte Gainsbourg. The Snowman will be released on Friday, October 20th, 2017!